The elephant in the room, the issue that seems to be evading many critic's reviews, is the casting of the titular character in the latest installment of George Miller's Mad Max franchise. Whilst previous episodes have hung entirely from the wild and astute, physical performances of a charismatic, unhinged Mel Gibson, the veteran actor is entirely absent from Fury Road. 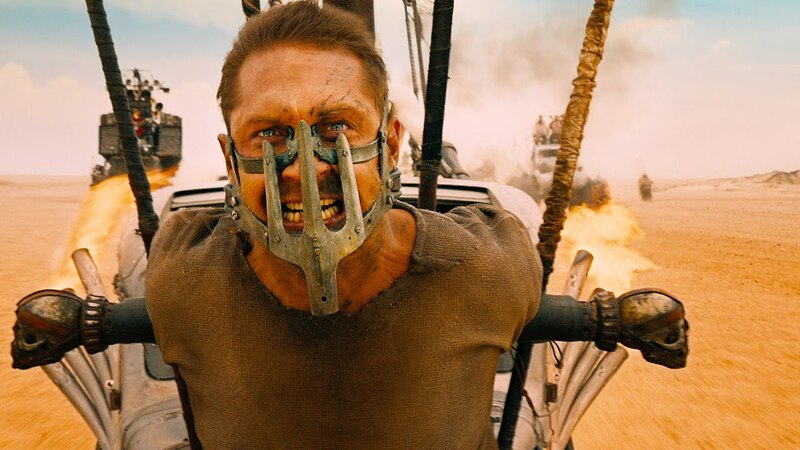 Whilst, from a PR perspective, this may be understandable, the damages this does to the final product are inconsiderable - Tom Hardy, the new Max Rockatansky, was (reportedly) a raging monster on the film's set, upsetting fellow cast and crew alike with his juvenile tantrums. Sadly, little evidence of such energies transferred to the finished movie; Hardy's largely lifeless performance is something of a black hole. Gibson may have given the production a few bad pre-release headlines but he, almost certainly, would have given a better performance than the inert, mumbling and bumbling Hardy specialises in (see also: The Revenant). Yet, I must state at this point, it would be unfair to review a film for what it is lacking rather than that which is present. And, in Fury Road, what is present in abundance is the unique aesthetic style Miller peppered previous Mad Max films with. Set, once more, in a post-apocalyptic desert-world, Miller has once again created a universe populated with machine men and women, battling with technology and a dying earth in an attempt to survive. This is an operatic world bizarrely splicing punk and industry with Hollywood Westerns and fetishisation of high-octane machinery. The latest installment focuses heavily on Imperator Furiosa (Charlize Theron) - a female lieutenant for Immortan Joe (Hugh Keays-Byrne), the self-appointed leader of the War Boys who capture Max and use his blood to sustain their own. Rockatansky is not the only victim of Joe's enslavement; five women, designated as Joe's "wives", are kept locked up to be used for breeding. This is a society in which the flesh, blood and organs of all but the most important individuals, are commodities which are taken or stolen at will of the powerful. Furiosa, sent to fill the War Rig vehicle with gasoline, betrays Joe in an act of female solidarity - stealing the tyrannical leader's "wives", she attempts to escape his clutches by fleeing into the sandstorms of an unforgiving wasteland. Max, noticing an opportunity to escape himself, must decide to either go his own path or offer assistance to the strangers seeking sanctuary from Joe. From this set-up, Miller offers an elongated chase which dominates Fury Road one spectacular set-piece after the next. At a time in which many action movies are dominated by CGI and continual fast-cuts to mask a lack of innovation, witnessing Miller's cinema of physical clashes, insane stunts, meticulous choreography and high speed vehicle crashes is truly electric. Those who criticise the latest Mad Max as lacking any real plot developments may be correct - that doesn't, by any stretch, make this a bad film though. This is a movie which returns cinema to its roots; that of shock and awe. This is a rare movie in which it can be guaranteed we will not see anything like it elsewhere. Yet, to return to the point which opened this review: Hardy is simply too bland, too empty for a role in a film this exciting. Although one shouldn't, its impossible not to imagine a version of this movie existing with a male lead performing with the appropriate levels of intensity - Charlize Theron, in the female lead, more than holds her own (to the joy of feminists everywhere), whereas Hardy often fails to raise his performance above a disinterested throaty grunt. Mel Gibson's time to shine may have (unfortunately) passed but, following on from rather suspect performances across an array of films including The Dark Knight Rises, isn't it perhaps time we question Tom Hardy's current prominence in Hollywood? If Hardy spent more time returning to the intensity he channeled in Bronson, and less time bullying his personal assistants and crew on film sets, then perhaps he'd become an actor of worth. Until then, he'll remain the continual weak link in films much more interesting than he.